The building at 600 W. Lafayette Blvd. is owned by an entity called 600 Ventures II LLC, according to city property records. Downtown Detroit is getting yet another hotel, this time a 154-room Cambria Hotel at 600 W. Lafayette Blvd. as part of a $47 million project that includes restaurants, a rooftop lounge and retail tenants. Choice Hotels International Inc. (NYSE: CHH) signed an agreement with 600 Ventures II LLC, a joint venture that includes The Means Group Inc. and Holdwick Land Development LLC, both based in Detroit, and Troy-based Koucar Management. Pending approval of city and state incentives and permits, the “upscale” hotel is expected to open in time for the North American International Auto Show, which moves to June in 2020, according to Koucar principal Joseph Caradonna. Choice Hotels cited the city’s “bustling” downtown area and close proximity to Cobo Center and national corporate headquarters including Ford Motor Co., General Motors Co. and Quicken Loans for choosing the location. 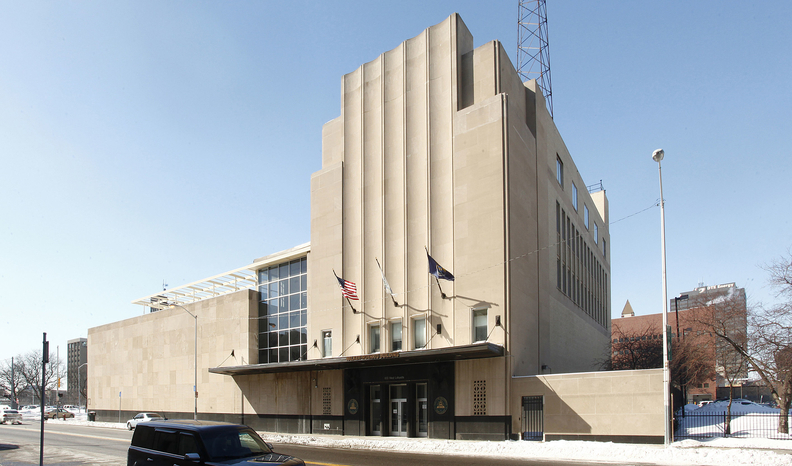 The Albert Kahn-designed building opened in 1936 as the home of WWJ-AM’s studios, according to historicdetroit.org. The existing 90,000-square-foot Walker-Roehrig Building will be redeveloped as mixed-use for hotel amenities, retail and office space. That will be connected to a 150,000-square-foot modular construction on the adjacent surface lot that will include a two-story parking structure that can accommodate 150 parking spaces, and four stories that will house 154 hotel rooms, according to Eric Means, head of the Means Group. The anticipated average daily rate is $180 per night, according to Caradonna. Total investment on the 240,000-square-foot project is $47 million. Renovations on the existing building have already started. Developers are looking to break ground on the modular construction no later than June 1, Caradonna said. Under the plans, both buildings will be linked by a connector bridge on the third floor, according to Means, who said the project will serve as a link from downtown to Corktown and will activate the adjacent Third Street. On the ground floor of the repurposed existing building will be an Italian restaurant from celebrity chef Fabio Viviani of “Top Chef” fame. Viviani said the new restaurant will serve brunch, lunch and dinner with all food made from scratch. The restaurant will be a “functioning venue on its own” that will complement hotel services and appeal to Detroit’s “hipster” and “business-oriented” crowds, he said. The restaurant will not be “white table cloth,” but approachable and casual, Caradonna added. A name for the restaurant has not yet been decided, but Viviani has several different concepts in mind. Viviani will also create the catering and events menus as well as the food service at the rooftop lounge. The development group is working with several potential tenants to fill more than 50,000 square feet of Class A office space and new retail space, which will include Detroit Taco on the ground floor. The developers did not disclose names of other potential tenants with which they are working. The building has been occupied in recent years by the American Federation of State, County and Municipal Employees local, Michigan Council 25, Colonial Supplemental Insurance and Miller Cohen PLC, according to CoStar Group Inc., a Washington, D.C.-based real estate information service. The ground floor will also have a grand ballroom, which will be able to accommodate 350-700 people sitting and up 700 stadium-style, that can be used for shows or comedy acts as well as private events, according to Caradonna. The third floor, where the hotel lobby will be located, will connect to the rooftop venue that will feature cabanas and occasional music and serve breakfast, lunch and small plates, he said. The architect on the project is Royal Oak-based Krieger Klatt Architects. TCF Bank is the senior lender on the project, along financing from Milwaukee-based with Pace Equity and investment from Invest Detroit, the developers said. The rest of the financing is owner equity, but the developers declined to disclose specific details. The building at 600 W. Lafayette Blvd. on the west end of downtown Detroit is 90,000 square feet. In the last five or so years, more than 2,000 hotel rooms have been completed, are under construction or are in varying stages of the development process in the greater downtown area by a host of local developers working with national and international hotel brands. 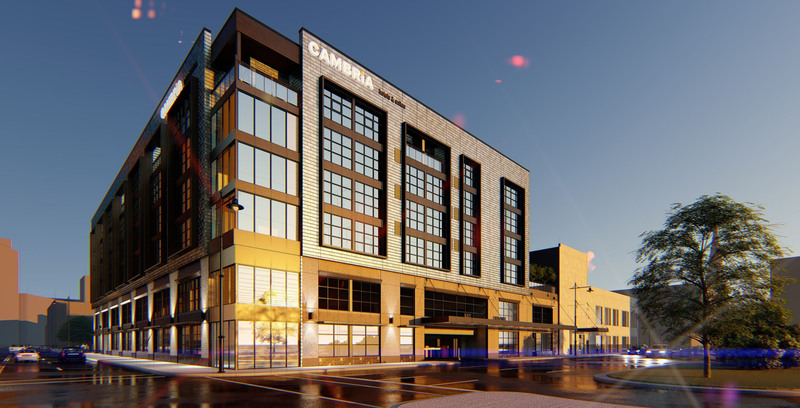 The Detroit hotel is part of a package of four Cambria hotels in strategic markets that Koucar Companies will deliver in the coming months, according to the release.